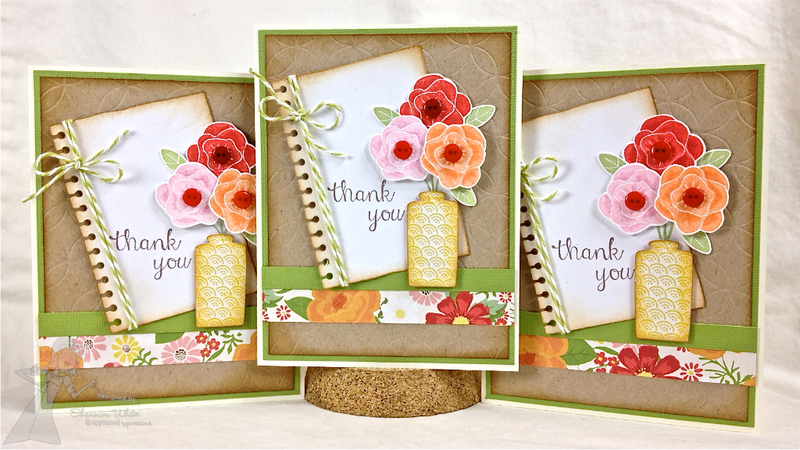 Well, today I am sharing the Brand New Posh Posies stamp set & separate Brand New coordinating Posh Vases Die set too! This set is just so pretty. Love everything about it. I love everything about these cards - especially the pretty colors and the way you used the notepaper die to highlight the flowers! Love the design elements on this!! So pretty! Beautiful cards! I love the color combos and great designs. So pretty Shannon! Love the lovely flowers and the beautiful spring colors. The vase is perfect... also like the pretty papers. Hi, Shannon! Love the way your last fabulous four creations have utilized kraft colored cardstock some how. It really is a great neutral color, allowing all your amazing shading and coloring to beam thru like sunshine through a cloudy day! So pretty with the shading and distressing both. Thanks for sharing! What gorgeous flowers, beautiful card. These are just gorgeous, Shannon! I love the colors you used for the flowers, and the button centers are just perfect! What a great layout with the notebook paper and the embossed bg looks fab! Love the piece of paper and the button centers. So adorable! Love the color combo and those flowers! Love the colors and wonderful use of the images!! There you again.... Whipping out multiple cards!! Wow, these are soo beautifuL!! Can't wait to see the entire sets!! Oh, my! Aren't those pretty posies! I love the colors, the vase, the design, everything! Just gorgeous Shannon, I love the zingy colours, fab papers, and the embossed background. Beautiful posies, and a great design too, gorgeous! What a delightful set of cards! 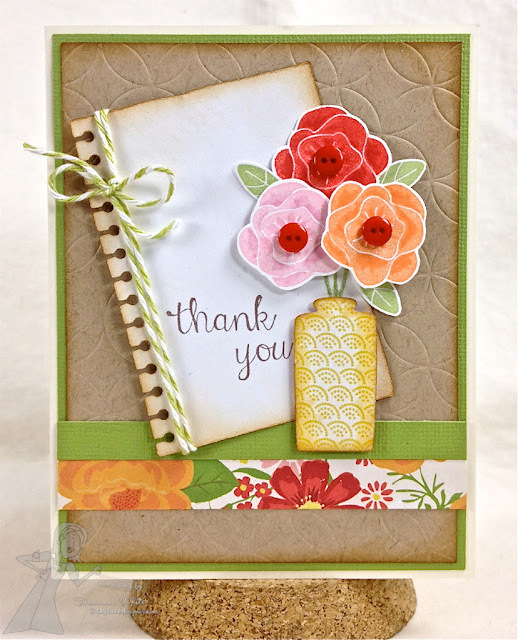 I love the "notebook" you created and the vase of flowers is simply beautiful! The softly embossed background looks perfect in kraft too! Great job on these! Gorgeous, Shannon! Love how your vase of flower pops against the subtle embossed background! Wonderful. Fabulous. Gorgeous. (Oh and I like the cards too)!!! Beautifully done Shannon! I love the design work you did with these papers and the vase and flowers are really neat. Love this card!!!!! I do love all the embossing. WOW these are gorgeous Shannon!! Beautiful image and colors! Shannon this is GORGEOUS I absolutely MUST get this set when it's back in stock! This color combo is SO BEAUTIFUL!! Love it! Happy Birthday -7 Kids College Fund - Big News!! !